I never was very good at staying inside the lines. I sometimes hear stories about people who decide to give up on creating art. My first reaction is always one of shock. How could they do that? How could they just stop creating? But I don't have to think very long before I remember just how difficult creating can be. It can be difficult when you doubt yourself. It can be difficult when you start overthinking everything that you do. It can be difficult when you let yourself worry about what other people may think. It can be difficult when you keep comparing what you create to what others create. It can be difficult when you second guess your ideas so much that you never even begin to create and find yourself procrastinating all the time. and, for goodness sake, (note to self) stop procrastinating! 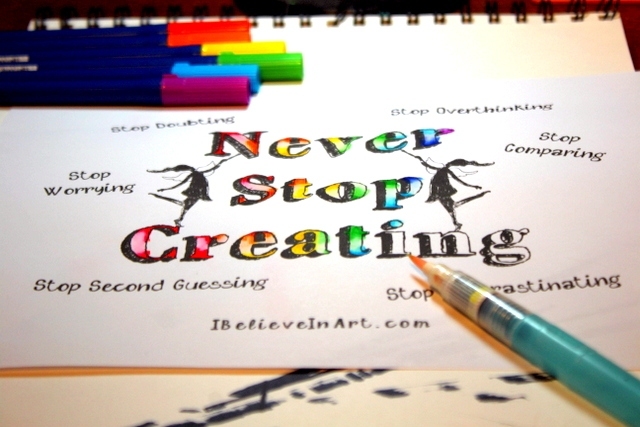 But Never, Never Stop Creating. And if you want something to remind you of all this, you can click here to download my Art Fairies: Never Stop Creating Coloring Page for free to color in (or not) and hang it up in your studio or use it in your art journal or give it to a friend (but no commercial use - personal stuff only, please). This design is also available as a full color poster and on other fun products at The I Believe In Art Shop. 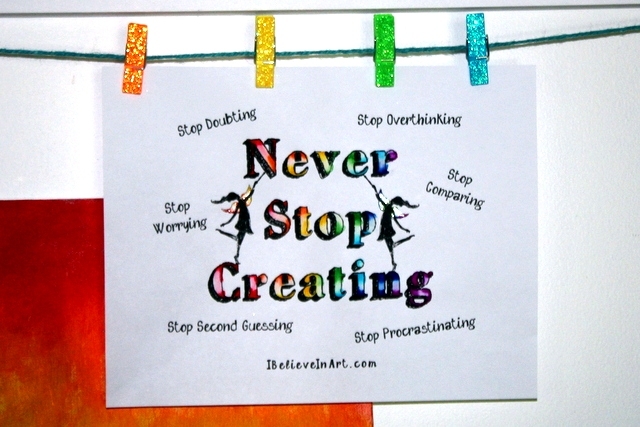 Okay, one more time: Never Stop Creating.